While unpacking some old boxes the other day, I ran across a computer I hadn't seen in some time. It’s a tiny machine with an integrated chiclet keyboard in a cream-colored case about the size of two VHS tapes set side-by-side. I’m talking about the TRS-80 MC-10 Micro Color Computer, of course. Introduced in 1983 by Radio Shack as an even lower-cost alternative to the chain’s larger Color Computer series of PCs, the MC-10 originally retailed for just $120 (about $286 in today’s dollars), making it the world’s cheapest color-capable PC at the time. Before long, the prices of far more capable competing machines (like the TI-99/4a) fell to a similar MSRP, making the value of the TRS-80 MC-10 questionable. 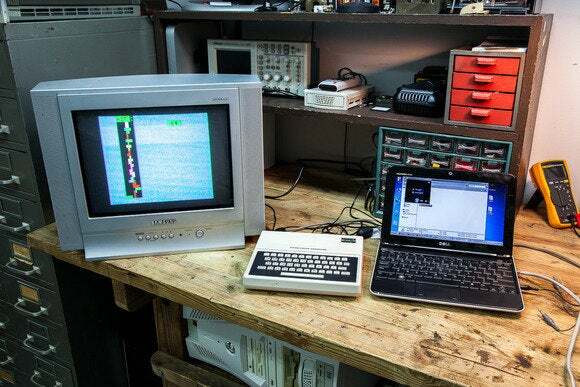 Radio Shack responded by dropping the TRS-80 MC-10’s price to $79.95, but because the PC couldn’t run software for any other Radio Shack computers, nor did it receive much software support in general, it never took off. Those issues didn’t dampen my interest. The weirder the machine, the more fun it is to collect. I actually have two MC-10 units, both of which I acquired a few decades ago at hamfests (local amateur radio swap meets). Due to the MC-10’s limited nature (I could use them to program BASIC, and that’s about it), I haven't used one since the late 1990s. I figured I’d give the MC-10 another shot. I hunted around for the proper 9V AC adapter that could power this tiny beast, and an RCA video cable for an RF connection. I hooked it up to my old Samsung TV, flipped the switch, and voilà: It still worked—well, almost. The machine presented a green BASIC prompt, but half of the keys on the keyboard didn’t work when pressed. When things don’t work, I know it’s time to get out the screwdriver. 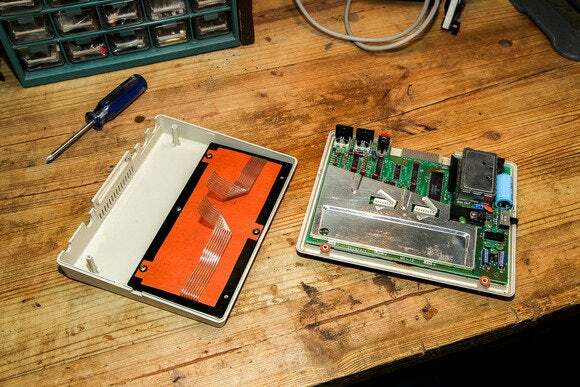 A mere four screws (and one warranty label) later, I easily opened this small slice of computing history into two parts. “Cleft in twain,” as they said in the old days. Once I opened the TRS-80 MC-10, I was able to reconnect the keyboard’s loose wires. Once apart, It became immediately obvious what was wrong: One of the two connectors that hooks the keyboard to the unit’s main board was loose, with a few wires sticking out. I’m not quite sure how it got that way, because a jostle strong enough to loosen a connector like that probably would’ve broken the case. Perhaps it was a manufacturing defect and it never truly worked to begin with. My efforts to get a better look at the MC-10’s Motorola CPU were thwarted by a soldered-on RF shield. While I had the case apart, I took a closer look at the motherboard. 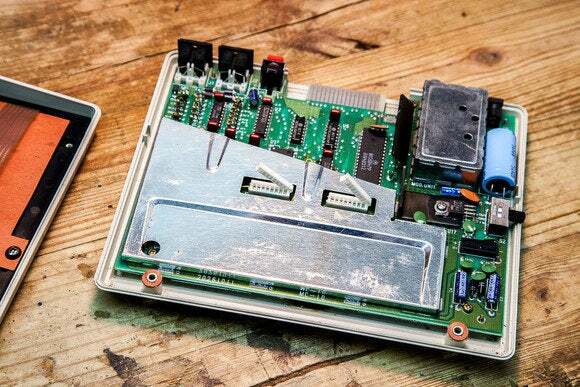 Unfortunately, the most interesting chips (like the unit’s 0.89MHz Motorola MC6803 CPU) were hidden from view behind a metal RF shield that was soldered in place. Wary of breaking anything, I left the shield alone, reseated the keyboard cable connectors, and put the whole thing back together. Next, I pondered what I could actually do with this obscure machine. Turning the unit over and looking at the back provided a clue: a cassette port! 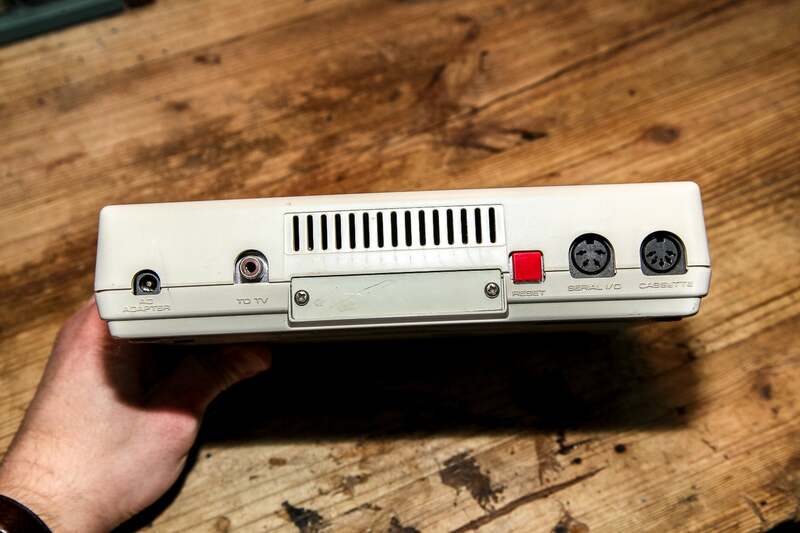 The back of the MC-10 reveals a selection of old-school ports, including a cassette port (far right). My mind reached back to the Internet of the 1990s, when retrogaming enthusiasts decided to make digital-audio-file archives of cassette tapes used with the obscure Starpath Supercharger cartridge for the Atari 2600. Using a simple phono cable and a computer’s sound card (back when digital audio hardware was an optional feature), you could play back the audio cassette data from your computer, and the vintage unit would think it was coming from a cassette tape. A quick search on the Internet showed that MC-10 enthusiasts often use the same technique to load and save data between this mighty mite and a modern PC. In fact, people still write games for the MC-10 just for the challenge of it. One of the best selections of MC-10 games online comes from hobbyist Jim Gerrie’s website. He lists more than 260 games from dozens of popular genres—from RPG to puzzle to arcade—that he has programmed in recent years for this tiny Radio Shack computer. I downloaded a complete collection of Gerrie’s games and converted the binary files to audio WAV files using a popular MC-10 emulator utility. 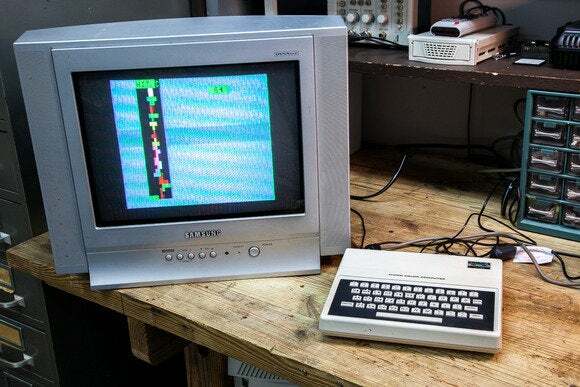 After that, I found a TRS-80 cassette cable and hooked it to my Dell netbook’s headphone jack (I knew that Dell would come in handy again some day!). Sadly, most of Gerrie’s games (and the best games on the platform) require the 16-kilobyte RAM expansion pack for the MC-10, which I don’t have—I’m limited to 4K of RAM. Thankfully, Gerrie has programmed a few primitive games that work with those specs. I picked one randomly—Tetris 4K—and loaded it up with Windows Media Player on my Dell. After typing “CLOAD” on the MC-10, I pressed play on Windows Media Player, and as if by magic, the vintage machine loaded the game into its memory. My old MC-10 hooked up to an old Samsung TV playing Tetris by way of a less-old Dell netbook. The Tetris 4K game is indeed very primitive—it renders just a few tiny columns of game space on the left side of the screen, provides a score, and that’s about it. Using the keyboard keys, you can rotate the pieces and drop them. It’s simple, but by golly, it works. Some 20 years after I bought my first MC-10, I finally played a game on it. I’d love to play some of the more impressive games on the MC-10, such as a fan conversion of Pac-Man and one of the few commercial MC-10 games ever released, Lost World Pinball. But that will have to wait until I come across a 16K RAM expansion pack. When that day comes, this tiny, charming machine will spring to life once again.